Team Course: Junior GS Race ski. It’s a lighter, softer version of Course using S Drive. Perfect for younger, lighter GS racers. - 5 Drive technology, cap front and sidewall translates to higher performance, lighter weight, easy turn initiation and snow sensitivity; incredible edgegrip, rebound, and energy return. - Extended sidecut which translates in to better initiation, finish and stability. - Pin Tail technology and Titanium alloy laminates which gives better edge hold, stability and a very smooth ride. 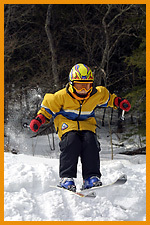 Team Omeglass: Junior Slalom Race is the latest in new slalom technology. It is a lighter, softer version of Omeglass designed for younger, lighter Slalom racers. Concept Junior: A light maneuverable ski for all terrain, adventure, tricks designed for younger juniors looking for adventure all over the mountain and in the terrain park. A kick tail, light weight construction and shorter sizing translate in to an easy turn finish, ski-ability, improved maneuverability and carving. Team Speed: A junior shaped ski for the youngest skiers learning to pilot, carve and play! Lightweight construction, shorter sizing and a deep sidecut translates into improved maneuverability and carving, plus user friendliness. More on Dynastar at www.dynastar.com.